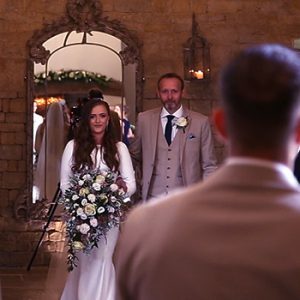 Millie and Phil were married at Blackwell Grange, an exclusive-use barn wedding venue just outside Shipston-on-Stour in an idyllic tranquil Cotswolds location. It was an early morning for us as we arranged to meet up with the groom and his ushers at the couples home in Evesham. When I arrived the boys were starting to get ready and once I’d captured footage of Phil and the boys enjoying a bit of breakfast and beginning to get ready it was time to head off to the wedding venue. Millie was getting ready in the Potting Shed, a beautiful room specifically designed for bridal preparations on the morning of a wedding. As I arrived preparations were going the hair and make-up artists were ahead of schedule. 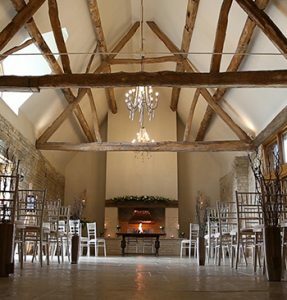 The Ceremony venue at Blackwell Grange is a stunning thatched barn dating back to 1543, however it has been converted beautifully into the perfect ceremony room, complete with large open fireplace which is a brilliant feature of this building. The flowers chosen complemented the room perfectly! The guests began to arrive as did the groom and the excitement and nerves started to build. 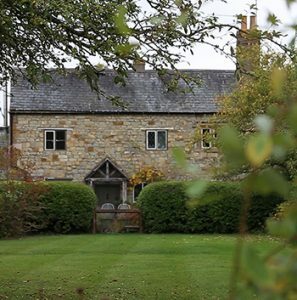 The staff at Blackwell Grange had everything perfectly under control as always and everything ran like clockwork. Once the ceremony was over the bride and groom and their guests made there way to the terrace where they were served drinks and canapes in the early autumn sun. The photographers began setting up group shots whilst I captured fun shots of the guests enjoying themselves and once the formal shots had been taken we took Millie and Phil off to get a few shots of them on their own. The grounds at Blackwell offer some very private areas where the couple can get away and have a bit of time to themselves (and the photographer and I of course! ), I try to capture natural moments of the couple more than formal shots. I think that a smile or a glance can really show on film, more so than in a photograph. We were then called in for the wedding breakfast and speeches which are a great opportunity to film loved ones telling stories about the couple. These always work really well on a wedding film as it is the only way these can be captured and it’s great to look back on in years to come! The evening reception was kicked off with some acoustic guitar and singing in the bar area of the Orchard Barn before the DJ took over and got everyone dancing. As the party got into full swing I said my goodbyes and left them to what looked to be a great party! I had an amazing day with wonderful people. Thank you for letting me capture your day Millie and Phil. It was a real pleasure and I hope that your wedding film brings all of the memories of your day flooding back every time you watch it!.